Rick Longworth sent a lovely video of hummingbird interactions at his feeder. Dextrous little buggers! 1. Staying alert for incoming – 2 O’clock high. Music: NZSM Guitar Quartet Carmen Suite on Vimeo. Here are some wildlife photos that I’ve collected from this summer. 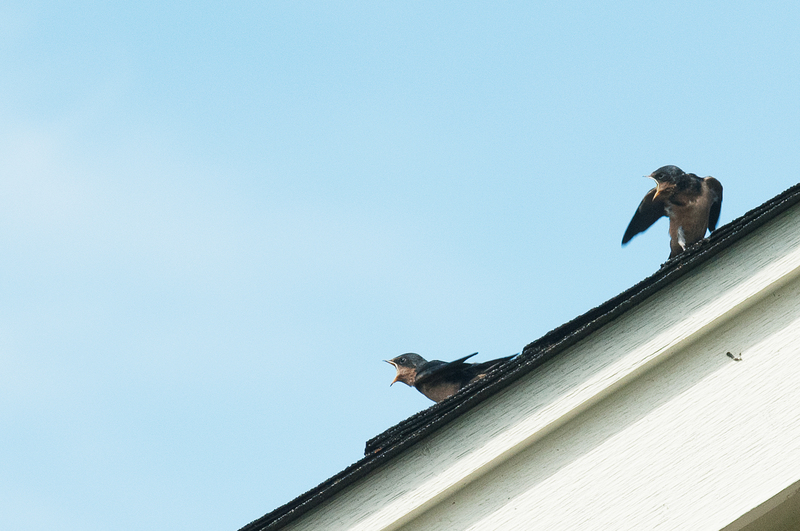 The first set of 6 is a family of barn swallows (I think, readers?) 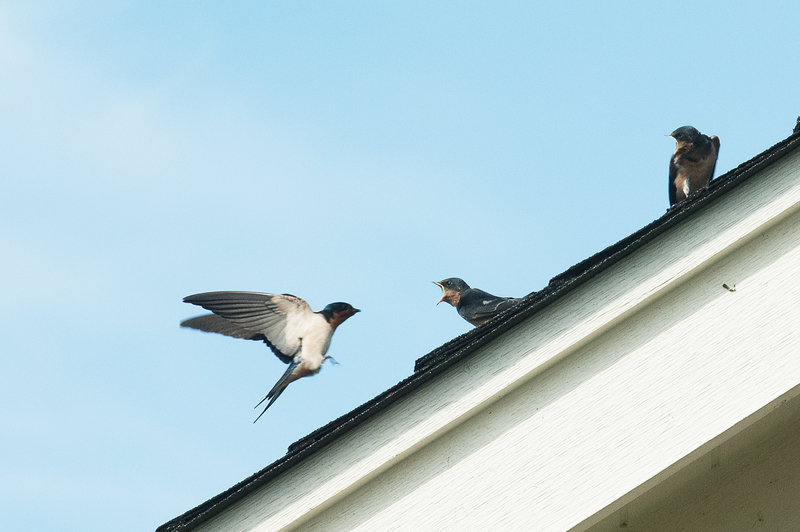 Hirundo rustica. 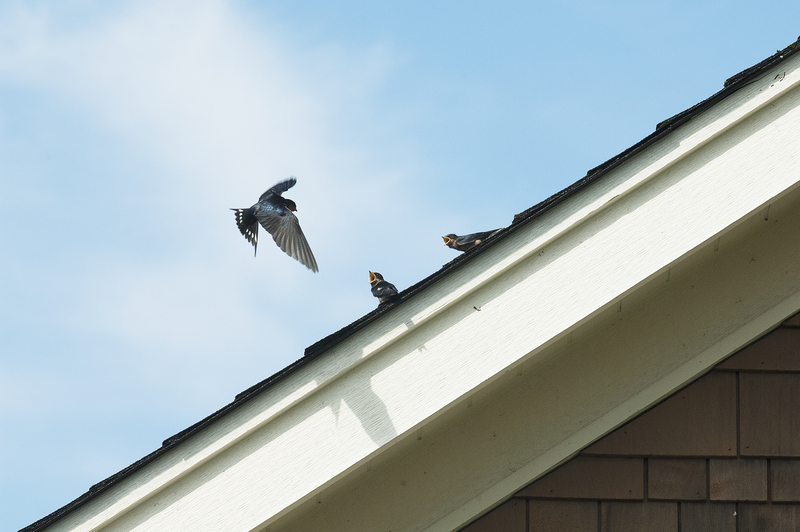 I knew there was a nest in one of our eaves because I could hear them rustling throughout the summer. Then we heard the chicks constant clamor after they hatched and were being fed. 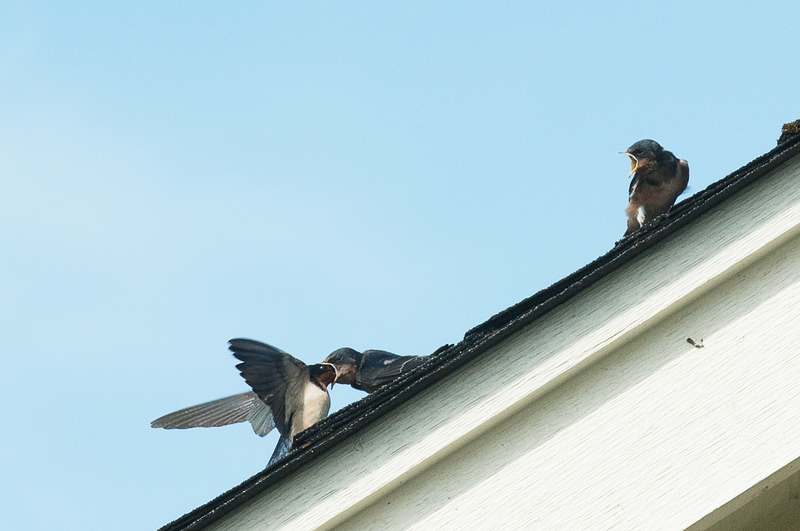 Well, this afternoon, I saw two fledglings out on our roof being fed by their parents. 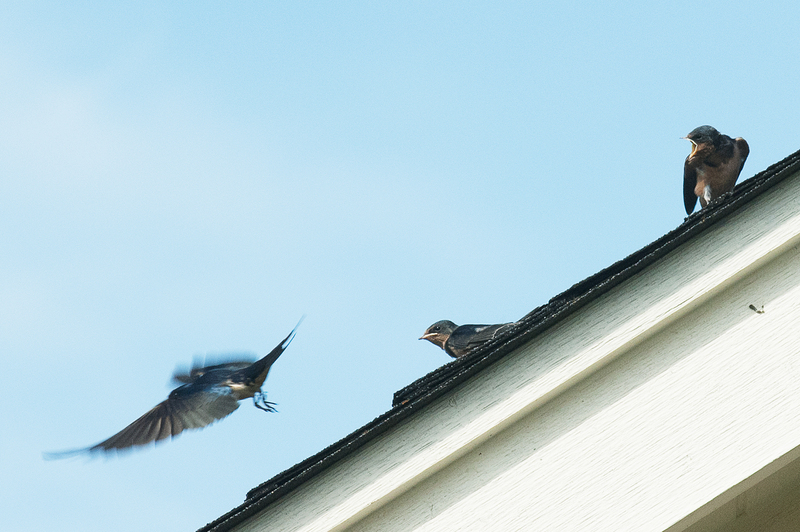 Every once in a while, the fledglings would fly around the house exercising their wings, but apparently they can’t feed themselves yet. I took this sequence on “continuous shot” mode (3 frames per second). The action photographed here in the first 5 photos took about 2 seconds. The first 5 photos are a feeding sequence. The 6th shot is a stand-alone action shot that I thought was cool. 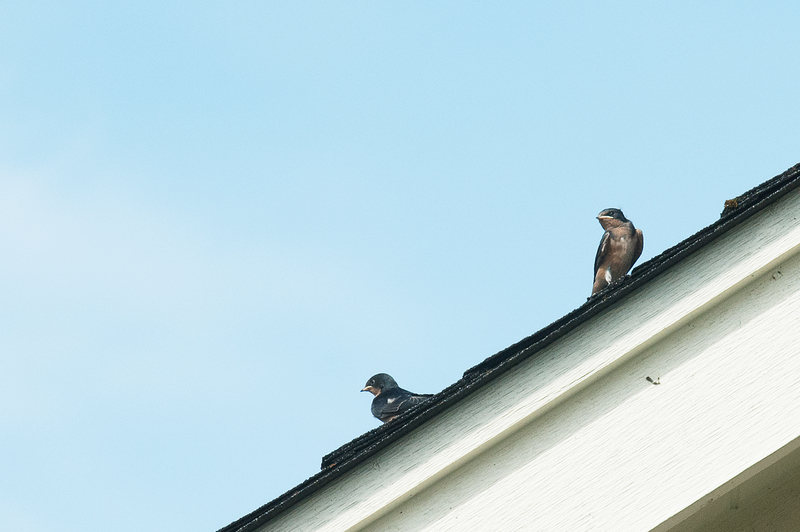 The last shot is what made me think they are barn swallows because of the blue back…plus the fledglings’ rust colored chins and breasts were another indicator. 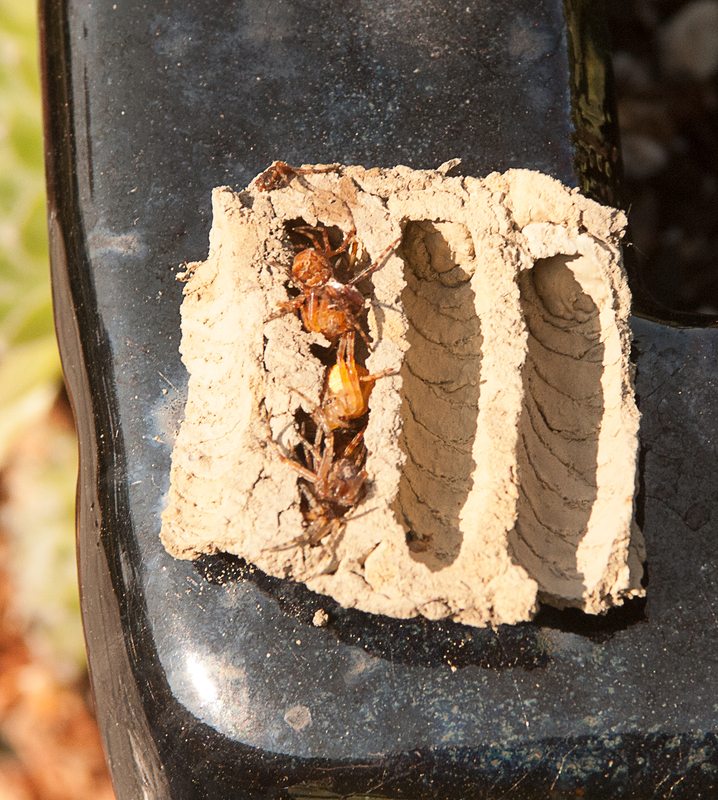 The next grouping is of the nest of a mud dauber wasp. My wife noticed the nest and asked if I could please remove it. I would have opted to keep it, but it was right next to the front door on a window shutter. I decided the best way to remove it (I didn’t want to use poison) was just to use a flat bladed shovel. Well, with one upward scrape, I removed most of the nest; but to my surprise and shock (I jumped back instantly) all these “things” fell out of it. I thought they were tiny wasps (why I jumped), but upon closer inspection they were spiders! The strange thing is they were all the same species of spider…small orb weavers. Their flesh was soft and cool and not desiccated, but they weren’t alive as far as I could tell. 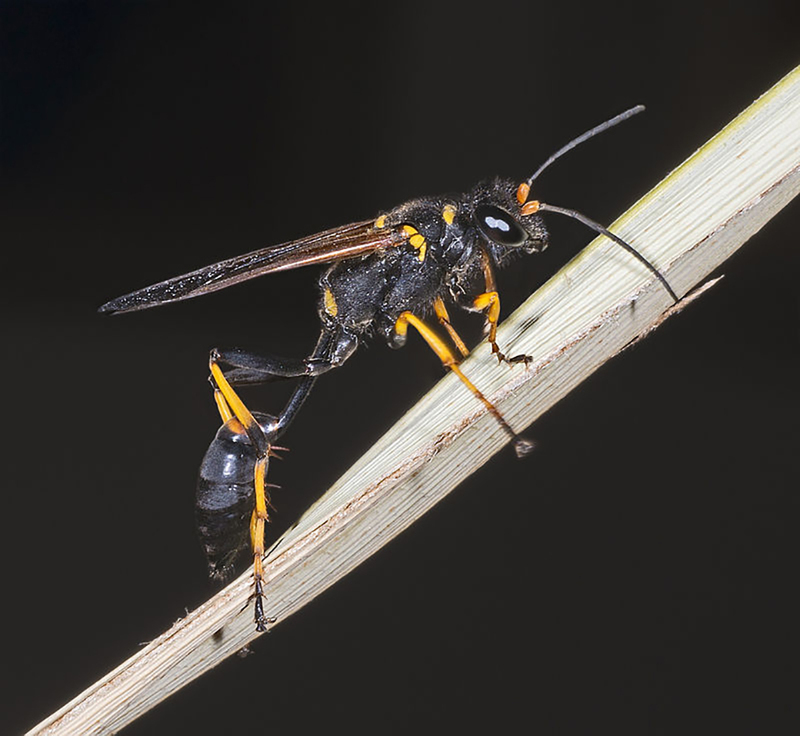 I read up on this type of wasp, and as I surmised, they fill individual tubes with paralyzed spiders and lay one egg in each tube for their larvae’s food. The larvae eat the nutritious spiders, pupate, overwinter and emerge in the spring. Hopefully this dauber will build a nest in another location (I felt bad about destroying her nest); it’s obviously a lot of work, all done by a single female. I never saw the wasp, but my wife did. After looking through some google images she identified it as the yellow and black mud dauber, Sceliphron caementarium. The second photo is one I nabbed from wiki. The first photo is the nest, most of it removed. You can see the outline of individual larvae tubes inside the mud walls, plus some spiders spilling out of the top tube. The top part is the nest still intact; it was basically a rectangular mud blob. The third shot shows three of the interior mud tubes, one of them filled with the spiders. Creepy and cool…there were hundreds of paralyzed spiders in that nest! Evolution truly is the greatest show on earth. The last two photos were taken by a wildlife camera I bought after being inspired by a reader’s wildlife camera shots on WEIT. They are both coyotes, Canis latrans. I noticed a clearing where a family was hanging out. The proud parents had three pups. I placed the camera along what I thought was an animal trail near where the coyote family was hanging out. After a couple days, I checked the card, and these are the two best shots I got. Both looking right at the camera! I don’t know how they noticed the camera, but obviously they did. Human smell? Acute observation? The first photo is of the mom I think (skinny and smaller than the other parent), the second is one of their curious pups. 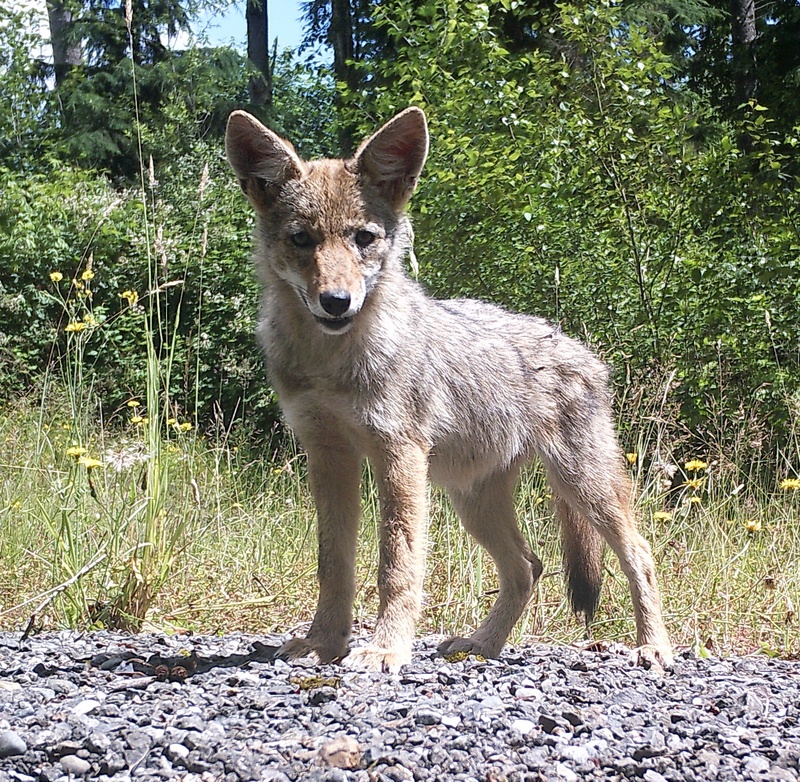 Even coyotes are cute as pups! This entry was written by whyevolutionistrue and posted on August 8, 2018 at 7:30 am and filed under birds, d*gs, insects, mammals, photography. Bookmark the permalink. Follow any comments here with the RSS feed for this post. Both comments and trackbacks are currently closed. Good stuff! Interesting design on the hummingbird feeder. I have not seen that one before. 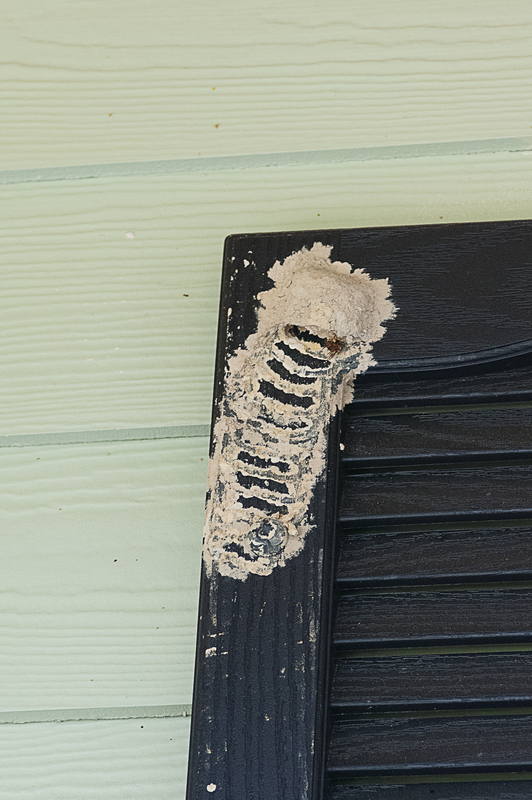 It does go against ones’ instinct, but mud daubers are solitary wasps and so as far as I have seen are completely non-aggressive at the nest. I have been right up on them without problem. 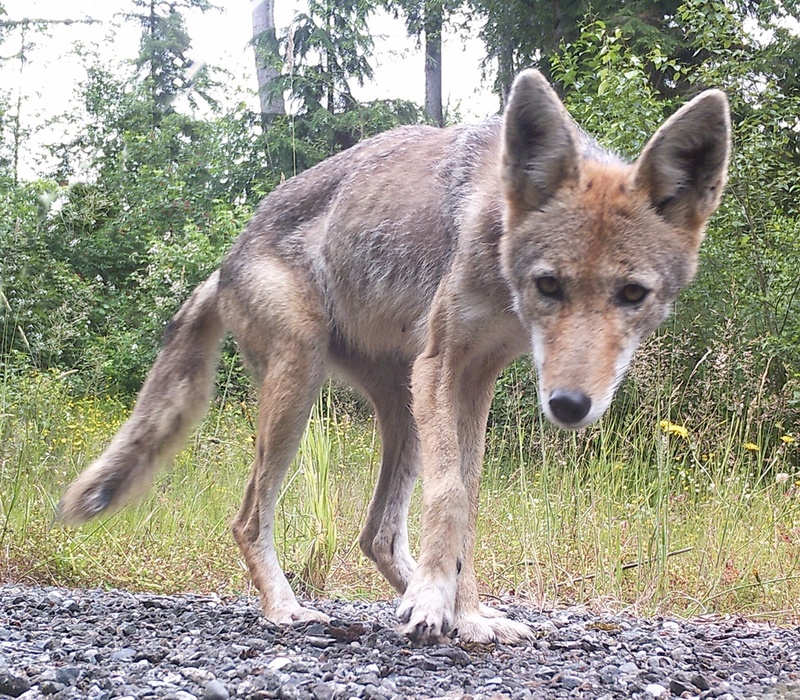 Those are terrific coyote encounters! Perhaps they see their reflection in the lens? I was going to make the same statement about the mud daubers not being aggressive. In fact, I currently have a small polistes wasp nest between my back door and screen door, and being 6’4”-ish it’s right near my head. I’ve been going in and out all summer and they just pause and watch me as I pass. I don’t slam the door or make any sudden movements and they’ve left me alone. If they had become an issue, Ive found a garden hose is a nice non-toxic solution. The wasps leave and don’t rebuild. Either way, I’m enjoying their presence and they’re tolerating mine so live and let live I say. I can speak from some rather traumatic experience with [i]Polistes[/i] that they get more aggressive later in the season. Yeah, I read they were docile, solitary wasps. I won’t knock down another if I find one. Re reflection on the lens; the lens is tiny…about the size of a nickel. But maybe it could. Next time I bring it in (I keep it out for a couple weeks at a time) I’ll see if I can see my reflection. I imagine it could have reflected sunlight to catch their attention as well. I suffered what I think is a yellowjacket sting day before yesterday. Haven’t been stung in decades. It was surprisingly painful, and swollen and itchy still. Powerful little fellas! I was stung by a yellowjacket last summer. Feel the burn! It itched for about a week, but the welt was there for almost a month! Well, then! I love living in the PNW forest, and should take take not to disturb the other residents, I suppose. The swelling has increased over the last 24 hours, which google says is quite normal. Luckily can still do all tasks as needed. Enjoyable photos and comments. Thanks all. Missing the ducks. Is Phoebe still there, Jerry?